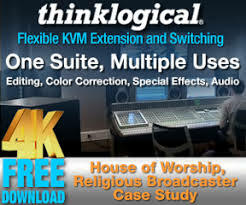 To build an effective video solution for your house of worship, it sometimes becomes necessary to think “outside the box”. As clichéd as the statement may be, even more clichéd is the expectation that people will be captivated by video systems that adhere to the same age-old principles of magnifying images and showing bullet points of a pastor’s sermon. Obviously the reason we use video, audio or any of these types of technologies is to communicate ideas and effectively connect with an audience. If your house of worship has yet to implement a video setup, then there is reason to celebrate: you have an open canvas on which to create! It also means that you have not yet made any costly mistakes! Fear not, with the right philosophy and planning, you can implement more engaging video presentations; ones that compliment the core focus of your ministry. Let’s talk about a common scenario seen in churches across America; the customary two screens on either side of a stage setup. First, let’s dispel a common myth: sometimes there’s really no reason for churches to have two screens. One will do just fine. 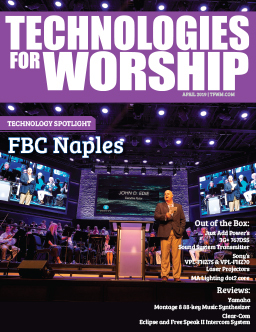 Many of these two-screen systems have been adopted in smaller facilities as a result of taking cues from larger churches, who have set up two-screen solutions because of sight-line issues. New churches often look to more established churches for how things should be done, and the two-screen approach is an unfortunate side effect. Keep in mind the reason that larger churches started using video in the services in the first place: to create rapport in a room that is generally not conducive to intimacy. If your church is small enough where sightlines to the stage are not an issue, adding screens can have an adverse effect and destroy the intimacy inherent in your smaller environment. You preserve this intimacy by using just a single screen above the stage. The single screen can be highly beneficial because essentially all eyes are focused on the center of the stage. In this way, the worship team and the Pastor are all in the same field of vision as the supporting video content. If you were to visit some smaller churches that have two screen setups, you’ll likely notice that the people in the first five rows are looking off to the side when the video screens are showing content, which has to be distracting to the worship leader or the speaker. Eye-contact is important for a sense of connection. The only reason people should be looking to the side screens is because (hopefully) the church is showing a compelling video presentation. If you can get away with it, try to only use one single screen above the stage. Video screens are often used to display content that enhances or amplifies what is being said (or sung) on the stage. This comes in the form of bullet points reinforcing the content the pastor is preaching, or displayed scripture verses for the convenience of attendees who do not have quick access to a Bible. For the component of the service where there is teaching, preaching, or speaking, there are some potential distractions with using video. One of the problems experienced when showing bullet points during a speaker presentation is that often they appear as a graphic that is on a screen, out of the visual field of the speaker. When that happens, there’s a disconnect, as people break eye contact with the speaker to look at the graphic. Something you may want to consider is to place a plasma screen right on the stage, beside the speaker. It’s akin to the flip chart used for years by pastors but allows more content flexibility. A display on stage can be set up so that the sermon notes will come up on the screen beside the speaker, adding to the level of connection between the displayed notes and the point the speaker is making. It preserves intimacy because the speaker is referring to notes that are right there beside him, as opposed to encouraging furtive glances to see the video displays. Newsrooms are increasingly using physical displays on their sets. It used to be that that the broadcast would show a “picture in picture” composited over a news anchor’s shoulder. With the advent of higher resolution flat screens and displays, more actual screens are now sitting near the talent with which they can interact. In mimicking this at church, you are preserving intimacy by putting the speaker within the same physical context of the notes that are being read. For the larger churches who want to use this approach, they can consider capturing the display on the stage as well as the speaker with cameras for IMAG on the larger screens if necessary. In essence, you would still be capturing the interaction between the speaker and the display notes, while the first few rows of people can comfortably retain a balanced eye-contact with what is happening on the stage. Another thing that has become very popular recently is the idea of architectural projection. This is where you take yourself out of the bounds of single or even multiple screens, and you start using the walls as projection surfaces, or for that matter any other part of the room. 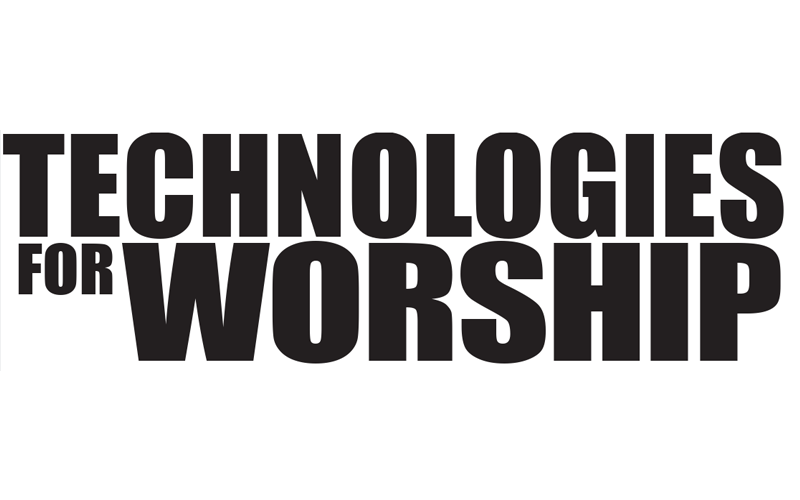 The great thing is that high powered projectors keep coming down in cost, allowing more churches to factor some of these creative options into their plans. At the recent DIRT conference in Arkansas, during the evening session, three 3500 lumen projectors run with a single computer displayed various imagery onto the front of NewLife Church. The effect was extremely compelling. If the lighting is appropriate, you can certainly do something like this in your sanctuary or auditorium. You can transform the look into whatever you feel fits the mood, whether it be a cityscape scene or a nature scene, or stained glass. Furthermore, because you’re breaking out of the realm of simply projecting an image onto a single screen, it is more all-encompassing. The visuals can potentially surround and take up your entire field of vision. It’s like going to an IMAX theatre where your entire visual scope is overwhelmed by the imagery. At my own church (North Point Community Church north of Atlanta, GA), we do not have a permanent cross hung in our auditorium. The reason is simple: people tend to ignore what they see every day. When the message revolves around Christ’s sacrifice on the cross, we use the appropriate imagery both in physical form as well as through video to foster contemplation about what the cross really means. You want people to feel the impact of opening their eyes to something they haven’t experienced before. It makes the visual all the more impactful because people aren’t seeing it every time they enter the building. Another idea from a recent church project involved making a cross out of LCD screens. They actually had six displays (four for the main vertical plank and two for the arms of the cross) and they were able to show visuals: stained glass imagery, images of Christ on the cross, in an ever-changing montage. It was very well done and extremely powerful. Even taking a flat screen display and rotating it so that it’s portrait orientation can be compelling, specifically because people are used to seeing boxes or landscape aspect ratios for displays all the time. A little ingenuity can go a long way in making an impact. Ultimately, the objective is to create a visual experience that people don’t see every day in their living room. One of the easy ways to do that is to break out of the 4:3 , or 16:9 aspect ratio box. If you can do visual imagery in a diamond, or a circle… use the technologies and the tools you have available. Just because you have a projector that shows a full 1280 x 720 pixels, it doesn’t mean that you need to use all of that resolution. People are used to seeing content in a 4:3 or 16:9 aspect ratio every day. If you show things on a unique screen or project onto different types of shapes, just in terms of visual impact, that is immediately compelling. Video can be an enhancement of your staging, which can involve all kinds of different technologies. Keep in mind however that video as a technical tool is meant to be compelling, not distracting. The visuals on the stage, or the screens, or the walls… the creation of the visuals can be highly emotional, and they can actually enhance the words that are being spoken. If we can use visual imagery to enhance, then it can make more of an impact than simply showing words on a screen.